Mine is usually a June garden, but this year it has mostly been a May one. That, I think, is mostly due to the frost-free winter. The June weather has not been wonderful, but the long evenings this far north mean that on the rare occasions the sun is out, the colours linger late. As regular readers know, I like working with large blocks of colour (and am lucky enough to have the space to do so). 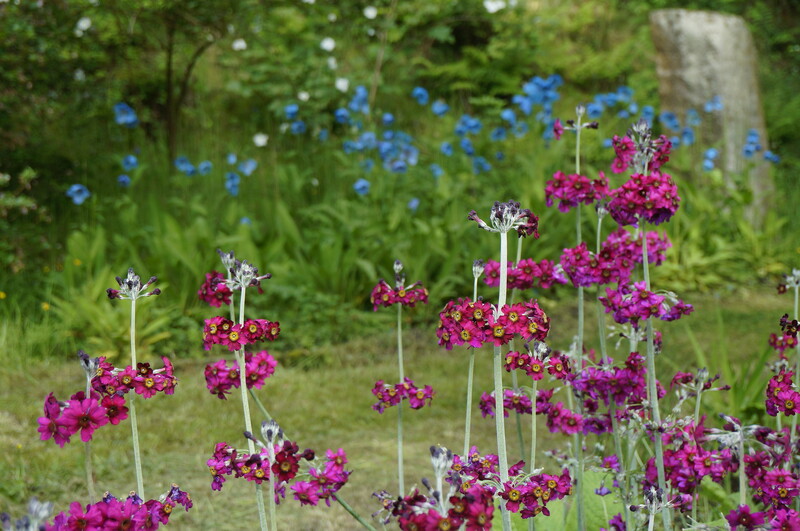 One of my favourite combinations is Primula pulverulenta against the blue of the himalyan poppies. That’s not a mix I would want to see indoors, but outside it works surprisingly well. A fantastically useful plant for a big vibrant red/orange statement is Euphorbia griffithii ‘Fireglow’. Like all euphorbias, it is unpleasant to work with because of it’s corrosive sap, and it also annoys me because you can’t just snap off its dead growth in spring, but have to cut out each stem separately. But I wouldn’t be without it. I use it against a background of yellow whin. 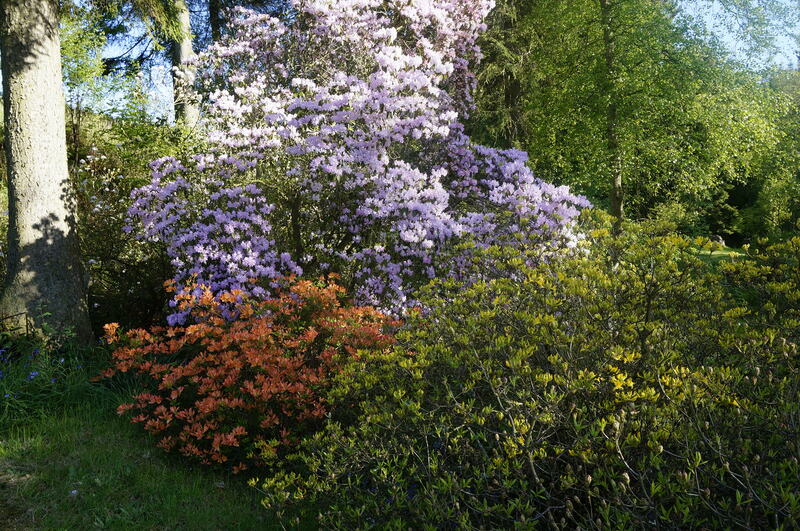 Finally, here’s a combination of rhododendron and azalea that pleases me. Unfortunately the timing is always just a little wrong, with the yellow not reaching its peak until the lilac is past it. But I guess that’s life. This entry was posted in Gardening in Scotland and tagged euphorbia griffithii Fireglow, June colours, wild flowers by kininvie. Bookmark the permalink. Oh Kininvie I’m a little breathless from the blue poppy image in the banner photo! Always amazing. I looked up ‘whin’ and found it was a thorny shrub. I learn so much. 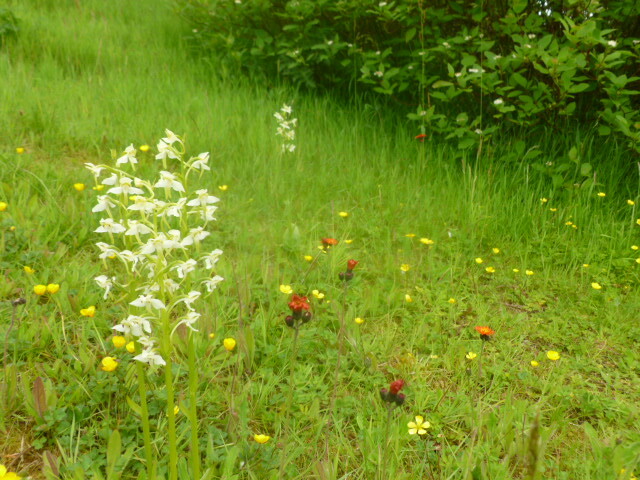 Butterfly orchids seem like something to NOT lose so I wish you luck with their reappearance next year. In general euphorbias are something I’ve found to have undesirable fragrance and to also be horrifically invasive and I rip them out. Except for a couple. I hope you have a good one. 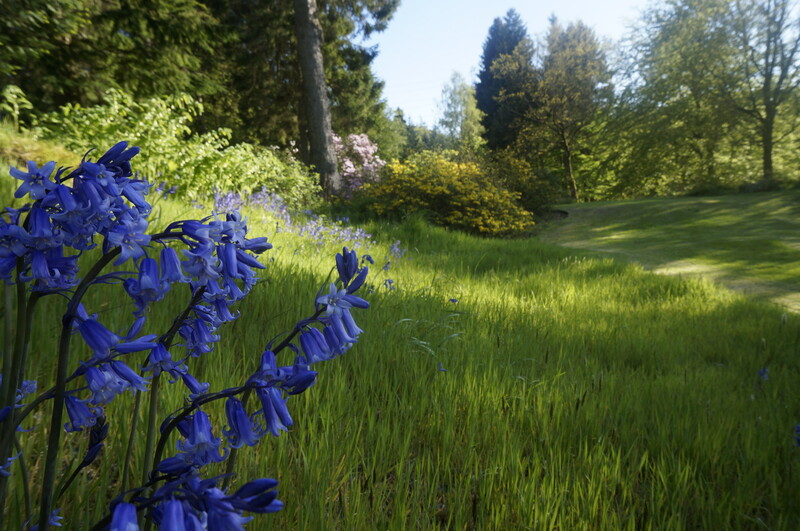 I loved the first image, all shades of green and rolling ground, with blue blooms and then Solomon’s Seal as a back curtain, nice and looks like Oregon. Wonderful, I was hoping to see your meconopsis, mine are now over for another year, so I can enjoy yours instead, which variety is it that you have? I do hope your orchid returns and that it is just having a year off! Your corner of the world is just beautiful, even if your flowers do refuse to cooperate. The poppies and primula are fabulous together but I also love the ‘Fireglow’ euphorbia. I’ve never seen that here.